Vascular Graft Market size is set to exceed USD 3.6 billion by 2024; according to a new research report by Global Market Insights. Rising geriatric population leading to high incidence of aortic aneurysms will remarkably drive market growth over the forecast period. WHO estimates that the geriatric population will rise to 1.5 billion by 2050. This demographic shift is attributable to decline in fertility rate coupled with increasing average life expectancy. Geriatric population is more prone to development of aortic aneurysms and peripheral aortic disease. Rising pervasiveness of thoracic and abdominal aortic aneurysms and peripheral aortic disease among growing geriatric population will favor market growth over the forthcoming period. 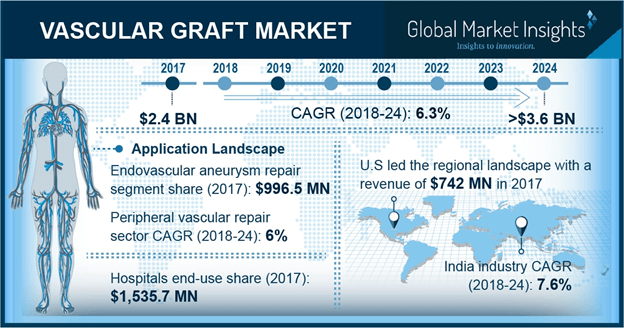 Increasing number of cardiovascular and end-stage renal diseases will spur vascular graft market in upcoming years. High blood pressure, lack of physical exercise and unhealthy lifestyle will in turn increase risk of cardiovascular diseases. According to Center for Disease Control and Prevention (CDC) statistics, cardiovascular disease was the leading cause of mortality in 2015. Rising number of end-stage renal disease owing to high prevalence of obesity will positively impact demand for vascular grafts and hemodialysis access, thereby driving industry growth during the forecast period. Polyester graft segment will grow at 6.8% owing to ease of material availability, high durability, and tensile strength. Polyester can also be used as base material for development of various biosynthetic grafts having less chance of rejection and superior patient outcome. Polyester grafts are used in various types surgical procedures for treatment of aortic aneurysms, peripheral arterial disease, and hemodialysis access. This will contribute to rapid market growth during the projected timeframe. Endovascular aneurysm repair segment held largest revenue, contributing to USD 996.5 million in 2017. Segmental growth is attributable to rising number of chronic cardiovascular diseases coupled with increasing demand for minimally invasive surgical procedures. Rapid healing and reduced hospital stay are among the major advantages of endovascular aneurysm repair. This will lead into momentous segmental growth over forecast timeframe. Hospitals segment was the largest segment in 2017 with USD 1,535.7 million. Increasing number of treatment options for cardiovascular and chronic kidney disease patients will boost segment growth. Various reimbursement policies in developed economies for treatment purposes will drive the business revenue in the upcoming years. Growing healthcare expenditure in developing economies and cost-effective therapies offered at various public and private hospitals will favor segmental growth. U.S. dominated North America vascular graft market in 2017 with revenue size of USD 742.0 million, owing to rising number of cardiovascular diseases. American College of Cardiology (ACC) estimated that in 2017, above 90 million Americans were diagnosed with cardiovascular diseases. Aging population coupled with sub-optimal diet are the major reasons for rising number cardiovascular diseases. Moreover, various reimbursement policies and favorable government initiatives in the country will foster regional growth in forthcoming years. Indian vascular graft market will grow at a significant rate of 7.6% owing to emerging cases end-stage renal disorders. According to study published in International Education and Research Journal, in 2016, there were about 7,852 people suffering from chronic kidney disease per million adult population. Growing healthcare infrastructure and prevalence of chronic kidney disorders will lead to rising number of hemodialysis procedures. This will further propel demand for hemodialysis vascular access. Moreover, growing awareness and education among Indian population coupled with cost-effective healthcare solutions will impel regional growth throughout the forecast period. Some of the prominent players involved in vascular graft market are Becton Dickinson (C.R. Bard), B. Braun, Cryolife (Jotec), Cook Medical, Endologix, Getinge AB, LeMaitre Vascular, Medtronic PLC, Terumo GmbH and W.L. Gore and Associates. These firms are adopting strategic alliances like mergers and acquisitions and new product launch to strengthen market position. For instance, in November 2016, LeMaitre Vascular acquired assets of Restore Flow Allografts. This acquisition will broaden its product portfolio and strengthen the company’s market presence for long-term growth in future.